The lack of great blogging apps for the iPad always puzzled me as a strange inconsistency with a device -- and overall, a platform -- that in the past year has proved to be more than a simple ecosystem for games and utilities. The iPad -- and to an extent, iOS -- has become more than a lightweight piece of glass and aluminum for watching movies and playing some Angry Birds. Sure it's great at those tasks, but then I look at OmniFocus, Simplenote, iFiles, or LogMeIn and I realize there's so much to do on this device than just consuming content. The iPad was indeed quickly dismissed by many as a "media tablet" when it came out last year: but think about the musicians, the writers, the designers and the movie editors that did all those amazing things using only an iPad. Clearly, this isn't just about playing games anymore. This isn't about the passive interaction with content: it's about the two-way relationship with consuming and creating content made possible by the 75,000 apps available in the App Store. But then I look at bloggers, people like me, and I don't understand why it is so difficult to rely on the iPad as a tool for working purposes. Let's be honest: if you're a geek and you happen to run a blog with lots of new posts added every day, you've had issues with using the iPad as your main work machine. We've all been there before: the soft keyboard takes a while getting used to, but it's the lack of great blogging software designed specifically for the iPad that make us question the possibilities opened by this device as far as blogging is concerned. Getting down to my personal issues with the iPad and writing for MacStories, I identify three main problems: the official WordPress app isn't that great (an euphemism); among the alternatives, several apps lack advanced functionalities like remote draft editing or custom fields; both 3rd party apps and the official WordPress one are terrible at allowing you to easily insert links, photos, and videos. We're swimming in a sea of text editors, but as I said many times on Twitter in the past we need a more powerful app -- something that combines the simplicity of text editors with rich features like media management and full access to the WordPress backend. I know, I'm asking for a complex solution, and quite possibly a software built for a niche rather than the Doodle Jump masses. After months of waiting for the perfect blogging app to come around and convince us that the iPad could also be used professionally for blogging, I looked at Blogsy with a bit of skepticism. At first glance, it seemed that this new app borrowed a lot from dPad, an HTML editor I reviewed a while ago that's aimed at quickly inserting media in documents. Considering that Blogsy, however, was touted as an app for bloggers with WordPress and Blogger integration, I decided that I could take it for a spin. Blogsy works with Blogger, self-hosted WordPress.org installations and WordPress.com blogs. I have tested the app with self-hosted WordPress -- in fact, this article you're reading was entirely written and edited in Blogsy. All the formatting, images and links went through Blogsy's content editor. The post was saved locally, uploaded to WordPress and published. The workflow was seamless, the XML-RPC integration stable and fast. There's a chance Blogsy won't make you consider switching to the iPad because your favorite blogging engine still isn't supported: if you've been dying to find a decent -- let me just say it, great -- WordPress app for the tablet though, then Blogsy might just be what you were looking for. Blogsy is a blogging app that packs a lot of functionalities into an elegant interface, but lacks some of the most advanced WP features I'll talk about in a bit. Once you've authenticated with your WordPress installation, the app will bring up a sample post that outlines the capabilities of Blogsy: namely, visual & HTML editor, full access to your WordPress posts / categories / tags, and easy URL and media management with a combination of drag & drop and a sidebar that sits on the right, waiting for you to choose content to embed in a post. Just like dPad, Blogsy features tabs in a side panel that allow you to insert photos or videos without leaving the app: Flickr, Picasa, YouTube and Google Images are supported. Unlike dPad, Blogsy also lets you insert any image or link from any website thanks to a built-in browser. On top of that, drag & drop support means you can easily move around and resize your media, as well as import content from the browser with a few taps and swipes. More on this in a minute. 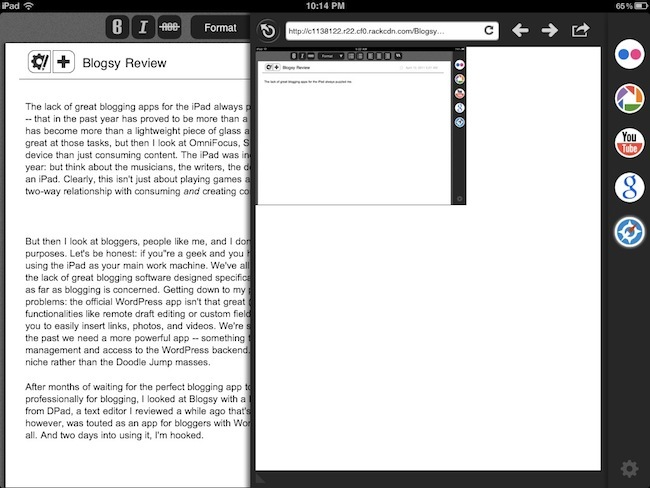 Blogsy's writing area isn't exceptionally big as the app features not one, but two toolbars above the main content. The first one resembles the default visual editor's toolbar seen in the WordPress online interface, only it lacks the media upload buttons. There are buttons to change the font to bold or italic, choose the format, set alignment, create lists and generate blockquotes. In the HTML editor, there's an additional button to set the "more tag", which can't be accessed from the visual editor. To switch between the two UIs, Blogsy requires you to swipe on screen. I'd like to have an optional button to switch between editors, as sometimes a swipe on the first screen could trigger a resizing process on an image you've inserted. Most of the formatting options, however, can be used both in the visual and HTML editor, with the obvious difference that you'll see an actual preview in the visual one. Whilst tapping on a word (or paragraph) in the HTML editor of Blogsy simply selects text and then you'll have to tap on the buttons in the toolbar to modify it, in the visual editor the text selection will invoke a custom copy&paste-like menu that contains quick actions to copy or attach a link. I love the Link popover implementation in Blogsy: assuming you have a link already in your clipboard (which you may have copied from Safari or, why not, the built-in browser), you just have to paste it into the URL field, set a title and choose to "open in a new window". Done. Toolbars and side panel aside, there are other features worth mentioning in Blogsy's main screen: a "+" button lets you create a new post at any time, and a timestamp in the upper right corner lets you set a publish date for the post. It's set on automatic by default -- meaning that as soon as you hit Publish the post will be visible on your blog. The title of a post can be written in the top section of Blogsy's editor, but you can't write the whole content in the visual editor (unlike WordPress): you'll have to switch to the HTML one, then switch back to preview it. If you're used to writing in the HTML tab on your WP installation this shouldn't be a problem, but it can be disorienting at first if you're thinking the app is not working because you tap and the cursor doesn't appear in the visual editor. Last, there is a gear icon that contains the most important information of your post: title, date, category, tags, status, and visibility. Blogsy can set a post's status to draft, pending for review or published; posts can be marked as public or private, and you can browse all your categories and tags or create new ones directly within the app. Comments can be allowed or disabled. There's no support for custom fields yet, but you can use this plugin to enable custom field recognition in any WordPress iOS app. Blogsy also can't let you modify a post's permalink (the title is used), but it gives you access to all your posts currently saved (and published) on WordPress. Even with a very large WP installation with more than 5,000 articles and hundreds of tags, Blogsy has been very reliable and fast at fetching content. I would like to see custom field support and permalink options in the future, as well as the possibility to set authors or upload directly to the WordPress media manager. It's pretty clear that some features had to be left out from the first version of the app, and hopefully we'll see more coming soon. 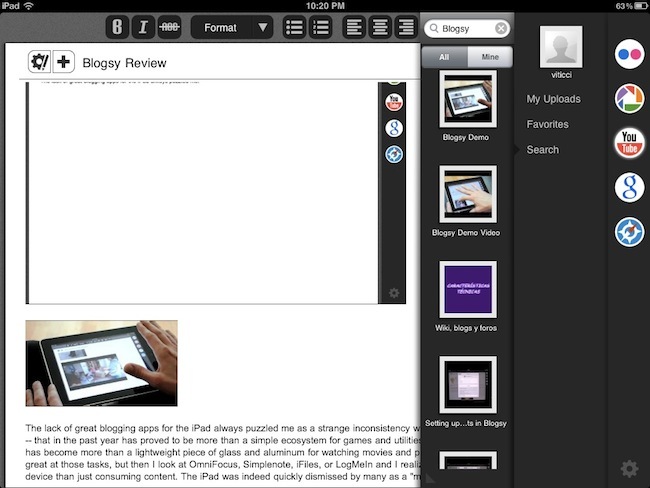 In spite of these notable lacks, Blogsy still remains the most innovative blogging app for the iPad I've tried recently. Let's see how the app handles Youtube videos for example. If you have a tech blog, it's very likely that sometimes you'd like to embed a video for a product demo, an announcement, or an interview. On the desktop, you have to open the Youtube video page, scroll down to the embed section, choose between old code and iFrame and copy the code accordingly to your blog's needs (read: size). Once copied, you have to open the WP editor, select HTML and paste. In Blogsy, the process has been made a lot simpler thank to multitouch and the app's aforementioned side panel: log in with your Youtube account, find a video to embed, and drag the thumbnail onto the content area. 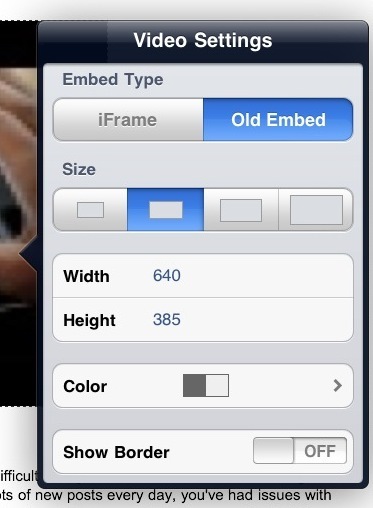 Tap on it, and set preferences like code type, width and borders from a popover. Of course you can do this stuff manually if you want, but I've found Blogsy's popover menu to be very reliable when setting width and height values or customizing borders. From the panel's Youtube tab, you can also browse your own uploads and favorite videos, but you can't preview videos before inserting them so you've got to make sure you've found the right video (you can just head over the browser tab and open youtube.com to play videos). I don't understand why a Youtube account is needed to embed videos, and I'd like to see this authentication removed from version 1.1. Login is also required for Flickr and Picasa, but you can freely browse Google Images without entering your Google credentials. The implementation of drag & drop works the same with images: when you've found an image you want to put in your post (like I said, no upload capabilities yet), all you have to do is tap, hold and drag onto the writing area. Once the image is inserted in the post, tap again to reveal a popover menu containing settings like size, URL, alt text, and alignement. There are some things I really don't like about Blogsy. Aside from the missing features I mentioned above, I experienced some crashes when switching back to the app from the multitasking tray (it happened twice) and noticed that sometimes the more tag from a post created in the WordPress online interface isn't recognized by Blogsy, and thus the post gets cut off. These technical issues need to be fixed as soon as possible. Furthermore, I really would like to be able to write in the visual editor as the HTML one doesn't default linebreaks to paragraphs -- you'll have to hit Enter twice to create a proper paragraph. Writing in the visual editor (like the WordPress' website) should easily fix this problem. Last, drag&drop (especially for images) is kind of buggy: you can't drag a file (which is represented by Fomo -- the app's mascotte -- during a drag&drop gesture) all the way down to the screen, but you'll have to scroll with the other finger instead. Plus, with articles that have lots of text it is difficult to drop an image exactly where you want to, and it's likely that you'll end up repositioning the image multiple times or cutting text to make it fit around a screenshot. So here's an idea: add an "insert image from URL here" action that lets you manually pick the place where you want to insert a file, and can also fetch the URL from your clipboard. I hope to see this (among other features) in the next versions of the app. Overall, Blogsy was a surprise. 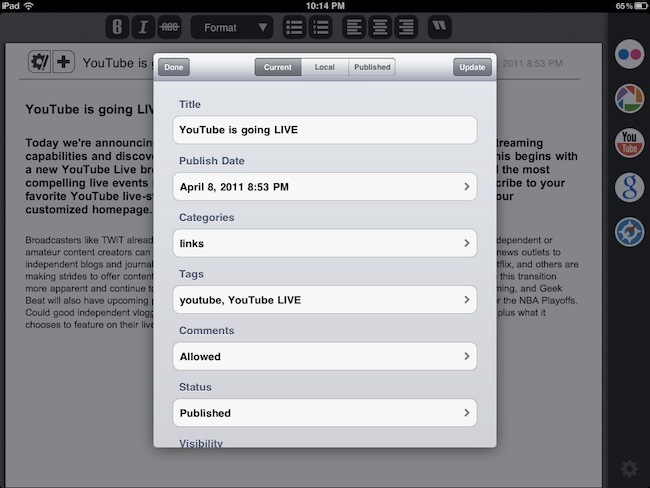 The app is far from perfect and it needs a couple more features to become the ultimate WordPress client, but it finally brings quality blogging to the iPad -- a device that was desperately waiting for an app like this to change the way bloggers can get things done without giving up on rich content editing, and media. If you consider that Blogsy is a new app with a (hopefully) long road ahead, I think I'll be able to write posts for MacStories exclusively from my iPad 2 this summer, even more than I already can with the current feature set. Blogsy can only get better from now on, and while we're all waiting for MarsEdit to show up on the App Store, I believe Fomola has released a great 1.0 version bloggers should check out right now. Blogsy is available at $2.99 in the App Store. Demo video below.